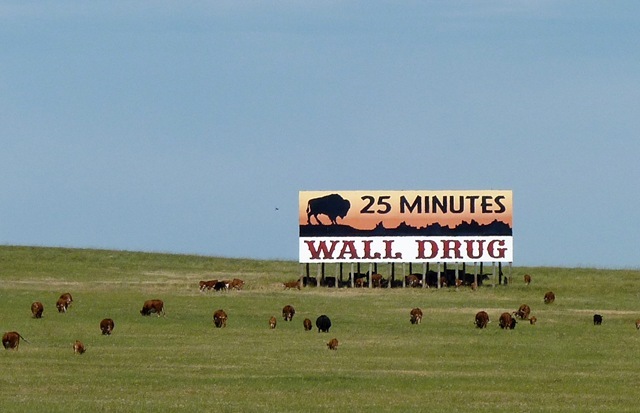 Roadside billboards have been around for over a century. And in the car-loving USA, billboard advertising is still an important—and efficient—way to reach millions of motorists. But if you are going to invest your hard-earned money in a massive, high rise advertisement, you want to make sure it’ll be a success. How do you ensure your billboard is both eye-catching and effective? Read on to learn the 5 rules of impactful billboard design. Your Brand means fun. And happiness. And awesome, attractive people love it. Your delightful fried birds will satisfy their cravings, and keep them full all the way to Omaha. Notice a pattern? To find your story, you take the key message and give it meaning: it could solve a problem, or evoke an emotion, or fulfill a need (even one they didn’t know they had until they saw your billboard). Because humans are terrible at remembering facts, but great at remembering stories. One traditional way to make an impact is by utilizing a short and fun play on words that’ll create a chuckle, or even a short rhyme that will help your message stick. The Oklahoma Soccer Association wanted people to feel curious about discovering soccer, so they played on the other foot-related thing that people are searching for: Bigfoot. It’s fun, whimsical, and evokes a sense of adventure, which would definitely get kids excited about playing soccer. A picture is also worth 1000 words, right? The YMCA’s basketball billboard uses a dynamic image to keep their brand top of mind. A large dynamic image can tell it all. In fact, an image will help retain your message better than by using words alone. Just make sure the image really does make an impact in 5 seconds or less. You can test this by sharing your design and asking friends to view it for only a few seconds. If they smile or smirk, great work! If they look at all puzzled you’ll want to try again. 2. Keep it short and sweet and safe! The average driver will only have about 5 to 10 seconds to view your billboard design, read any text, and comprehend the message. In those 5 to 10 seconds, the driver could also be glancing from the billboard, to the road, and back to the billboard again depending on the severity of traffic. That’s even less viewing time on your ad! So one of the most important rules to follow will be keeping your message short. Very short! Shoot for a maximum of 7 words or less. After your initial message you can consider any other relevant information. Need to provide a phone number? Is there a logo to implement? How about a location or highway exit number for attracting motorists to a venue? Just be sure to prioritize the most important information so your billboard doesn’t become cluttered or illegible. A larger-than-life-sized layout is no time to be meek! Make sure any text in your design is printed in clean, bold font to ensure the best readability. Also, the larger the font, the more time a driver has to read and understand your message at a distance. So go big! Use bright colors or a bold image in your design to effortlessly attract eyes to your billboard. Contrasting colors within the design will also create an even bigger impact that will help improve the retention of your message. But in order for your image to be effective you’ll want to keep your background simple to ensure the foreground isn’t fighting for attention. And stick to one large image or photo. That one dynamic image will create much more visual impact than a handful of images that only take up a quarter of the layout each. If you find you’re still in need of a fun story for your billboard, consider the location where your design will be displayed and use that environment for a clever message: Poke a jab at techies in California’s Bay Area, use local slang to read wit-ty to a hungry market, or appeal to “hungover” motorists leaving Las Vegas (and if they’re heading East that’s another opportunity to be damn funny as they make their way towards the Colorado River). Career website Dice ran a billboard campaign playing on stereotypes of techies in startup-heavy San Francisco. You can also take advantage of highways with several miles of territory between towns to pique the interest of any hungry, tired, or bored travelers with simple signage that repeats itself. Have a unique attraction that shouldn’t be missed? A comforting rest stop for a traveler in need of amenities? If so let drivers know of the closing distance between them and your destination by setting up several designs, placed miles apart from each other, to let drivers know they’re almost there. No need to be clever if you don’t want to, but your message will still need to be short, bold and legible. Ready to get your own amazing billboard design? A-sign the perfect designer to your project.